...iPhone EIRP in the lab has not always been so compromised as it appears to be this year. 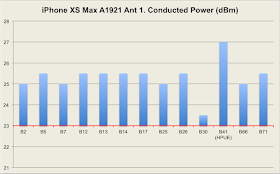 Real world RF performance comparisons when some users switch from the iPhone X and 8 generation to the iPhone XS generation, no doubt, will be interesting. Well, over the weekend, more and more early adopters started getting their hands on their brand new iPhones, posting their real world impressions online. While opinions on RF performance have varied from high praise to utter disillusionment, some anecdotal user reports and empirical signal comparisons at MacRumors forums and in more than one Reddit thread have been notable because they appear to corroborate how the aforementioned lab test results submitted to the FCC might extrapolate to less than stellar real world performance. In many ways, this harkens back to iPhone 4 antennagate in 2010. Without rehashing all of the details, iPhone 4 users just by holding the handset could bridge together unintentionally two antennas on the edge of the phone, thereby accidentally detuning both antennas and significantly degrading RF performance. In response to the issue, Steve Jobs famously was misquoted as saying to users about the phone, "You're holding it wrong," which since has become a blame redirection meme unto itself. Apple's official response was to provide all iPhone 4 purchasers with a free case to insulate the antennas from users' casual embrace. But returning to the present, if the disappointing RF performance that at least some appear to be experiencing eight years later with iPhone XS and XS Max does boil down to another antenna issue -- weak antenna gain this time -- holding the handset differently or adding a case/bumper is not going to solve the issue. Some have proposed that, if necessary, an Apple firmware update or two will sort this out. Yes, iOS revisions and/or carrier updates can tweak the way the baseband modem interacts with wireless networks at large. And, from an end user perspective, this can improve (or degrade) perceived performance. However, what software cannot do is update physical qualities locked in during design and manufacturing. An analogy for this could be the LCD or OLED display screen on your handset. New firmware might improve image quality by way of adjusting gamma curve, color calibration profile, scaling algorithm, etc. But that software update cannot change the screen size or pixel resolution -- both are physical characteristics. In that spirit, if Apple acknowledges an issue and a fix, what software or hardware remedies could it propose? Apple could submit to the FCC OET a Class II permissive change filing, which is an amendment to an original equipment authorization filing with additional lab testing to reflect a material change in the device. Let us take a look at two possible Class II changes that Apple could implement, though for reasons to be explained, Apple probably would not pursue either one. Conducted power is the input to the antenna, while radiated power (EIRP) is the output from the antenna. But with increased conducted power, increased EIRP also would result. This could help RF performance in situations in which the uplink hits its power limits before downlink reception drops below usability. However, this is not a likely solution. For an LTE device that operates in Power Class 3 (non HPUE) in a specific band, its target conducted power is 200 mW (23 dBm) +/-2 dB. Similarly, for Power Class 2 (HPUE), target conducted power is 400 mW (26 dBm) +/-2 dB. As noted in my previous article -- see quote below -- Apple already has applied conducted power somewhat liberally, pushing the +2 dB margin for conducted power across most bands. ...conducted power is not the issue. The standard conducted power target of 200 mW (23 dBm) is +/- 2 dB. And Apple is using the +2 dB margin to enhance its figures, pushing 250-320 mW (24-25 dBm) conducted power across many included bands. This extends to band 41 HPUE, which has a standard conducted power target of 400 mW (26 dBm). Again using the +2 dB margin, Apple has upped that ante to 500 mW (27 dBm). 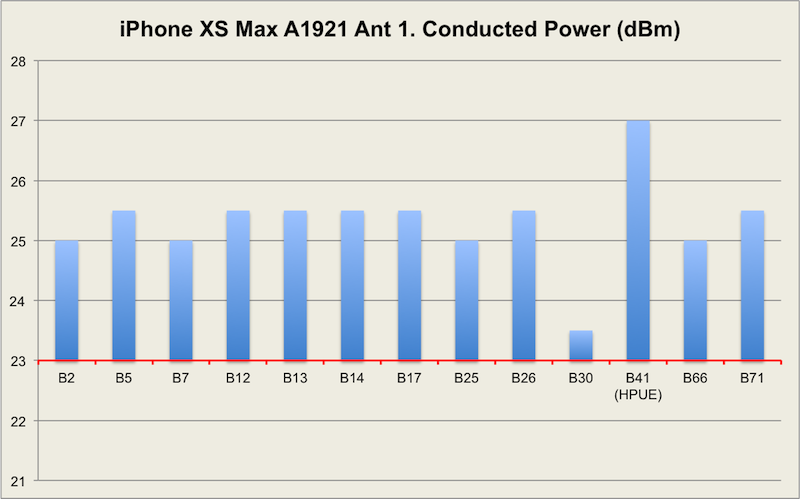 Then, for visual reference, see a graph of iPhone XS Max conducted power. Note that this graph is expressed in dBm instead of mW to reflect more directly the up to +2.5 dB boost Apple already has applied to conducted power above the standard 23 dBm and 26 dBm target levels, respectively. Without HPUE across all bands, Apple has little, if any additional wiggle room to increase conducted power. And, remember, bumping up conducted power helps only with uplink transmission. It does not improve downlink reception. Increased antenna gain would cause increased EIRP -- with or without increased conducted power. Additionally, as long as the same antenna arrays are used for both uplink transmission and downlink reception, improved antenna gain can assist in received signal strength, too. This sounds like the ideal solution. And, quite frankly, it is. But for even more obvious reasons, Apple would be highly unlikely to go this modified hardware route. This would be the nuclear option, so to speak, that would require some redesign and retooling of yet to be manufactured iPhone XS and XS Max units as well as possible replacement of extant phones for any dissatisfied users. Instead, any antenna design changes probably will be saved for next year's iPhone generation. So, what can iPhone XS and XS Max users do right now? The new iPhones undoubtedly show some measured RF shortcomings compared to their predecessors and other comparable handsets. However, the jury very much is still out on how much and how often this will affect typical use cases. In the interest of investigation, many users already have jumped to comparing signal bars, though doing so is not very useful, since signal bars are just a coarse approximation of signal availability/quality and can be calibrated to almost any arbitrary standard. Comparing speed tests also is not very useful for gauging weak signal performance. Unless a speed test fails or produces very slow speeds due to exceedingly marginal signal conditions, devices with 4x4 MIMO reception -- such as iPhone XS and XS Max -- likely will exhibit higher download speed test results under most good to normal signal conditions. Accessing Field Test to compare signal metrics (RSRP, RSRQ, CINR) across multiple devices actually is useful. But this must be done with a watchful eye and solid understanding. PCI, GCI, and EARFCN all must be the same in the same location to ensure that both devices are on the same PCC of the same site and sector. Any difference among those matching signal characteristics eliminates a legitimate apples to apples comparison. So far, Field Test reports are scant, though many more should be forthcoming as savvy users put their new phones through the paces. This article just got linked at MacRumors. Your posts are getting linked on all the Apple sites. Running speed tests on my iPhone Xs against T-Mobile LTE Cellspot V2 fed with gigabit fiber has been an interesting experience. The Intel Xs has only managed to pull a maximum of 72 Mbps downstream, compared with 120+ Mbps downstream with the Qualcomm iPhone 6s. Additionally found that the Xs could only pull about 220 Mbps from the nearest upgraded macrocell, compared with the 6s at 190 Mbps. I was in an Apple store last night thinking about getting the X's as my family all have iPhones. I currently have an Android phone with qualcom modem. I decided to test it out. I connected to the same wifi that the demo devices are connected to and tested. Results were the same. Android device with qualcom was 4x faster then iPhone xs. I tested on multiple devices with the same results. Could this also have an impact on GPS signal? My iPhone Xs consistently has less confidence in the current location than may iPhone 8 Plus... still wondering why. Yes, GPS could be impacted. Typically, a GPS antenna in a handset is collocated with a cellular antenna or a Wi-Fi antenna. If one or both of those antennas is low gain, that could extend to GPS reception. But on that note, pure GPS is a received signal only. So, GPS is not subject to transmitter testing submitted to the FCC. And that means that little, if any information on the location and performance of a GPS antenna may be included in an FCC OET authorization filing. So are all devices affected? I am planning on bringing my iPhone XS Max A1921 to the apple store and having it swapped out. After reading this article it seems futile. That depends on what you mean by "affected." What can be stated is that every iPhone XS Max A1921 has the same negative gain antenna array and Intel baseband modem. Whether one or both of those are the causes of some user issues remain unconfirmed. I live in vermont in a low signal area. I now have a great camera that is sometimes a camera. I added a line do my 6plus is still operational. The 6 plus still works as it did. The new XS or Max not so much. In house Wi-Fi and calls drop won't answer -- I'm actually excited when it answers correctly. Incoming first answer it will say call failed,wait and it rings wait, wait a ring before picking up and it answers (sometimes) but caller has only called once. Question, the LTE report part 1 from the FCC application for the XS Max shows an antenna gain table in section 5.5 (Maximum Antenna Gain)that shows columns for four antennae. However, only the columns for ant1 and ant2 are populated below a frequency of 1700 mhz. Does that imply the XS doesn't use 4x4 mimo on bands below 1700 mhz? In otherwords, the XS only uses 2 antenna with LTE bands 12,13,14,17 and 71?